As our Fall Migration experience begins to wan, we are welcoming the arrival of our wintering snow birds. Not just the retires fleeing the pending cold and snow, but those bird species that arrive here for the same reason. As a change from watching for migrating passerines, I spent a couple days looking for some of our resident species. Last Monday, after completing a doctor's appoint in Cape Coral, I sought the Cape's more special species. Namely the Florida Scrub Jays at the Festival Park Neighborhood where a large and unexpected covey of Northern Bobwhites was flushed. And then the Burrowing Owls and Monk Parakeets at the ball fields on Pelican Boulevard. Nearby Rotary Park as been a hot spot this season, but was very quite on a short visit. On Tuesday, visited Babcock-Webb WMA in Charlotte County. Arrived at sunrise at the Red-Cockaded Woodpecker Colony on Oil-Well Grade. This location has been disappointing lately as it appears that this woodpecker cluster has dropped to a single RCW. Today this individual could be heard as it exited his hole, but immediately flew away from my direction. Eastern Towhees, and Eastern Meadowlarks were very quite and few were encountered. No Bobwhites, Brown Thrashers or Sandhill Cranes were head or seen. Did see and hear several newly arrived House Wrens. Got nice views of a couple of Brown-headed Nuthatches and spotted both a Northern Harrier and a Sharp-shinned Hawk. Palm and Pine Warbles were everywhere as well as Common Warblers, Downy Woodpeckers, Eastern Bluebirds and Belted Kingfishers. From Babcock, I spent a few minutes to check-out the pond located in a pasture just south of the Punta Gorda Airport, that can sometimes host some very nice bids. Today only found a few Mottled Ducks, a Lesser Yellowlegs and a Western Sandpiper. Then on to check-out Kiwanis Park in Port Charlotte. This venue had recently hosted some coveted migrants, including rare in peninsular Florida, Yellow-bellied Flycatcher, Philadelphia Vireo, Black-billed Cuckoo and Golden-winged Warbler. But I failed to get here in time to see these species, (had to work) before favorable winds arrived to push these guys across the Gulf of Mexico as they trek south. arriving about noon, the park was quite. few species on hand. Did sight my FOS Eastern Phoebe, an American Redstart and a family of Black-bellied Whistling Ducks. I had never been here before, but will add it to my stops in the future. Most all of the expected shorebirds seen wintering at Bunche Beach, save Dunlins and wintering gull species, are on hand. Elsewhere, we're seeing the numbers of Palm Warblers growing and Eastern Phoebes, Common Yellow-throats, Pied-billed Grebes, Tree Swallows, Northern Harriers and Yellow-bellied Sapsuckers are just arriving. as well. Still waiting on the arrival of Yellow-rumped Warblers, Blue-headed Vireos, and Ruby-crowned Kinglets. So too will be the arrival of wintering waterfowl. Blue-winged Teal are already here and in the weeks ahead we'll see Ring-necked Ducks, Lesser Scaups and Northern Shovelers. Even later we'll see Red-breasted Mergansers, Horned Grebes, Common Loons, Gadwall, Ruddy Ducks and hopefully a couple of Snow Geese. The Birding this September along the boardwalk at Six-mile Cypress Slough Preserve has been quite rewarding. Were not seeing any great fall-outs, but there has been a steady movement of birds passing through. Acadian Flycatchers and Eastern Wood-Pewees are seen almost daily. 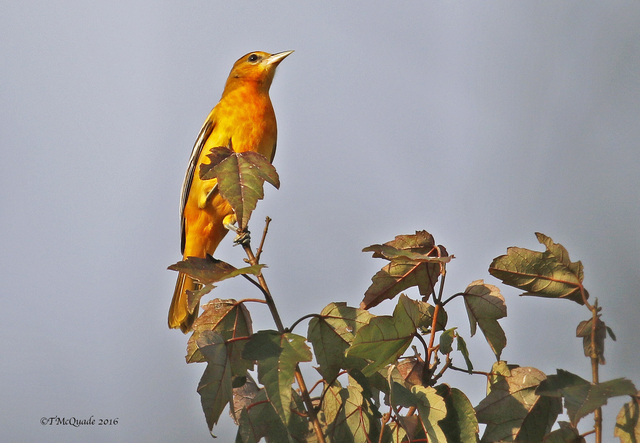 But perhaps one those Black-billed Cuckoos or Yellow-bellied Flycatchers or a Philadelphia Vireo may yet stop by. They are unusual sightings along the Florida peninsula, but are being reported at migrant hotspot to our North. One recently seen, but infrequent species to observe here were multiple sighting of a couple of Canada Warblers. The Prothonotary Warblers were seen in very good numbers in August, but have become uncommon lately. But perhaps one those Black-billed Cuckoos or Yellow-bellied Flycatchers or a Philadelphia Vireo may yet stop by. They are unusual sightings along the Florida peninsula, but are being reported at migrant hotspots to our North.